Coinciding with the final preparations of the Indy 500 at Friday's Carburetion Day, Firestone Indy Lights competitors earn the chance to claim a prized Indianapolis Motor Speedway victory with a 100 mile affair. The Firestone Freedom 100 for 2010 consisted of 16 cars and drivers (some competing on shoestring budgets) for the Indy Light series' biggest race on the 2.5 mile historic oval. In Wednesday qualifying for the Firestone Freedom 100, English driver Pippa Mann took the pole with an average lap speed of 187.989 miles per hour. Her first Firestone Indy Lights pole, Mann became the first female driver at the Indianapolis Motor Speedway to start 1st in an event. Unfortunately Pippa Mann's time in front didn't last long as her #11 car was bypassed early as Wade Cunningham and Charlie Kimball jetted out front. 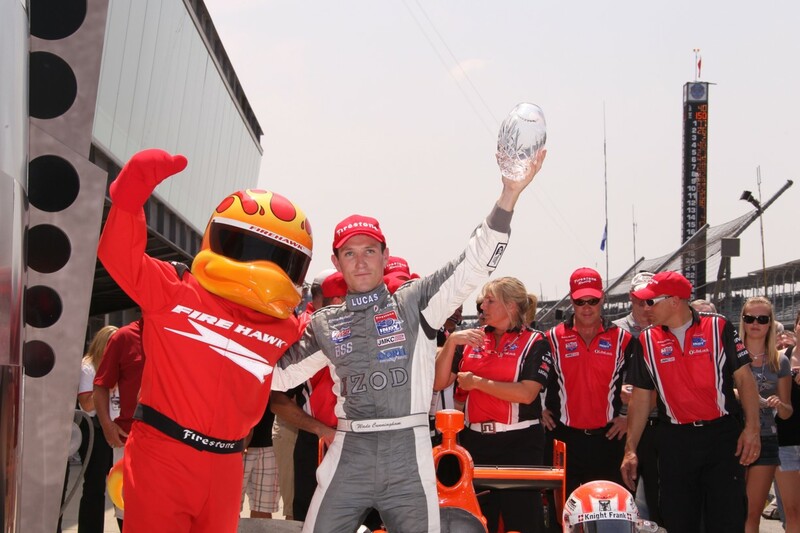 A heartbreaking blow to a driver who had experienced a very short-lived led at Indy, Pippa Mann's 2010 Firestone Freedom 100 race would end way too early. Early jockeying for position caused Martin Plowman to force the #17 car of Jeff Simmons. Unable to keep control of his race vehicle, Simmons spin out of turn 1 on lap 3. 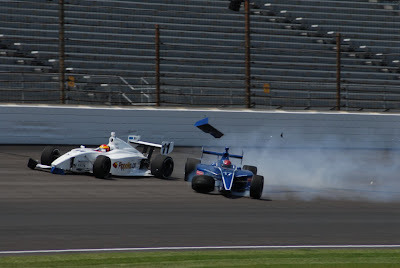 Pippa Mann, directly behind Simmons at the time, was collected rendering her car out of competition. Mann, hardly able to work up a sweat in race after being the polesitter, was shaken mentally and physically by the accident. "I've got some pretty bruised feet, and I'm going to have a very sore neck tomorrow. I'm pretty angry, but I'm OK." Pippa Mann said following her retirement from the Firestone Freedom 100. 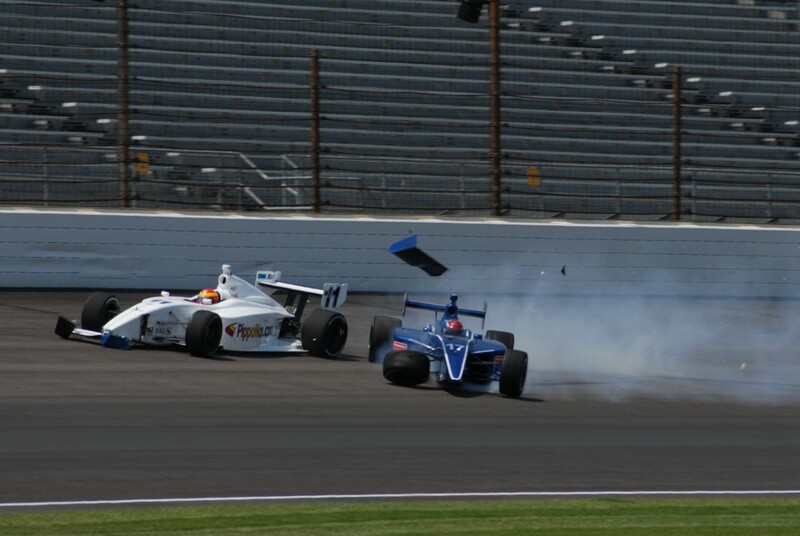 Taking two top-5 starters out of the 40 lap event, this would be the only caution to fly through the Firestone Indy Lights race. While Charlie Kimball was able lead 2 laps on the day, Wade Cunningham in his #77 Sam Schmidt Racing car dominated the Firestone Freedom 100 leading all but the circuits Kimball claimed. Winning his third Freedom 100 race in 2010, Cunningham's previous Indianapolis oval wins fell on even numbered years (2006 and 2008). Though leading most of the 40 laps, New Zealand driver Cunningham credited the #23 of Kimball for "..driving a smart race and hanging back". In reality, Charlie Kimball's car was not a qualified match to the #77 of Cunningham. "The setup wasn't exactly where we wanted it to be. I ran out of tools about midway through the race." Kimball said adding praise to Wade Cunningham and his two prior victories at the Indianapolis Motor Speedway. Finishing third for Team Moore Racing was James Hinchcliffe who raced with a car he compared to "a rocket ship". While he was able to stay in the draft with Cunningham and Kimball, Hinchcliffe ran out of time as well as afoul of an uncooperate lapped car to cost the Canadian driver an even better finishing position. Dan Clarke and Martin Plowman rounded out the top-5 in the Firestone Freedom 100 race. Current Firestone Indy Lights series points leader J.K. Vernay experienced a difficult race at Indianapolis Motor Speedway. In post race, Vernay stated that his #7 Sam Schmidt Racing machine lacked power throughout the event. Finishing 4 laps behind in 16th spot, J.K. Vernay struggles reshapes a large points lead for the Frenchman into a narrow 5 point margin over Charlie Kimball and 23 markers ahead of 3rd place in Indy Lights points James Hinchcliffe.